A reconstruction of the Stikes dinosaur death trap. Adult and juvenile Utahraptor dinosaurs attack an iquanodont dinosaur trapped in quicksand. By Julius Costonyi. Don DeBlieux, Paleontologist, Utah Geological Survey. 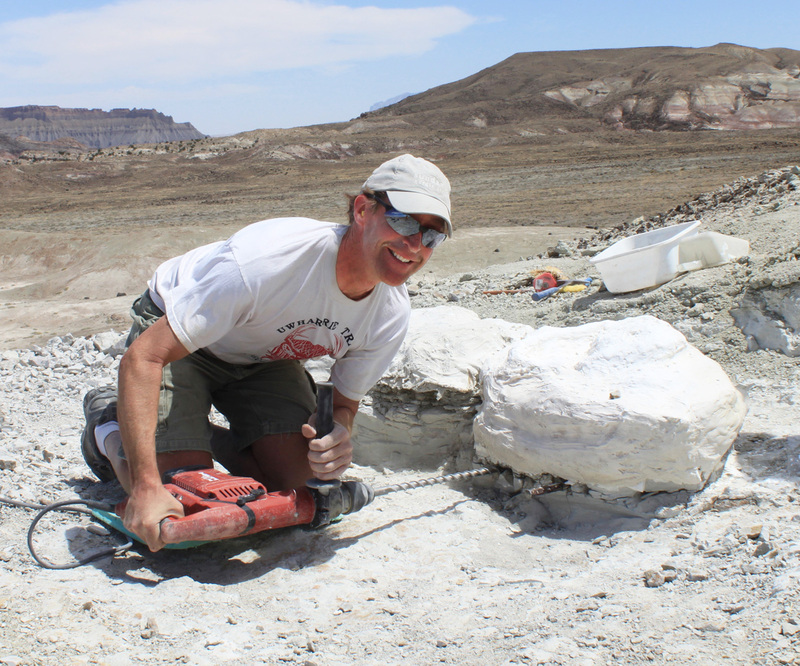 Don DeBlieux has been with the Utah Geological Survey for the past 14 years where he serves as the Utah Assistant State Paleontologist. Don oversees the UGS field paleontology program and fossil preparation lab. 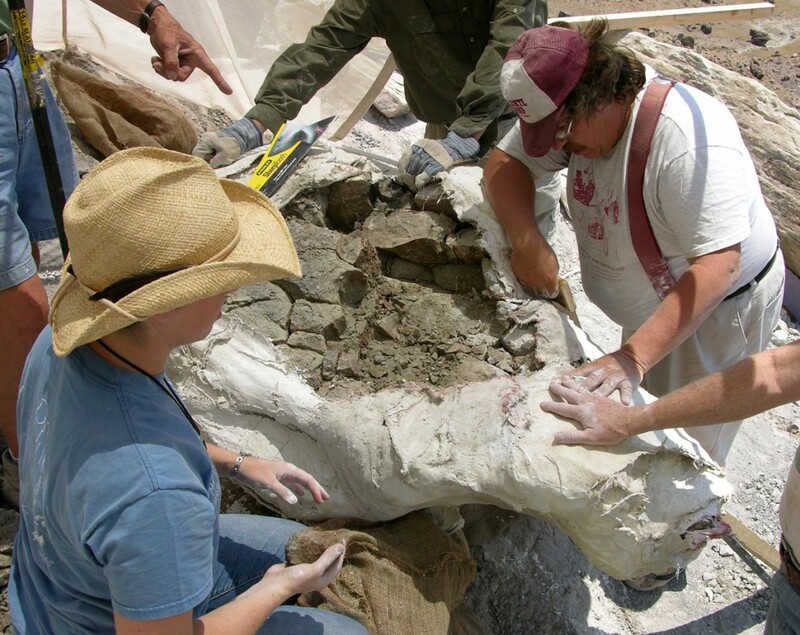 He has authored and coauthored over 20 professional papers and helped to discover and name six new dinosaurs and two new fossil mammals from Utah. Over the past 30 years, he has help to lead dozens of field expeditions searching for vertebrate fossils in the western U.S., Egypt, Madagascar, Namibia, and Tanzania. 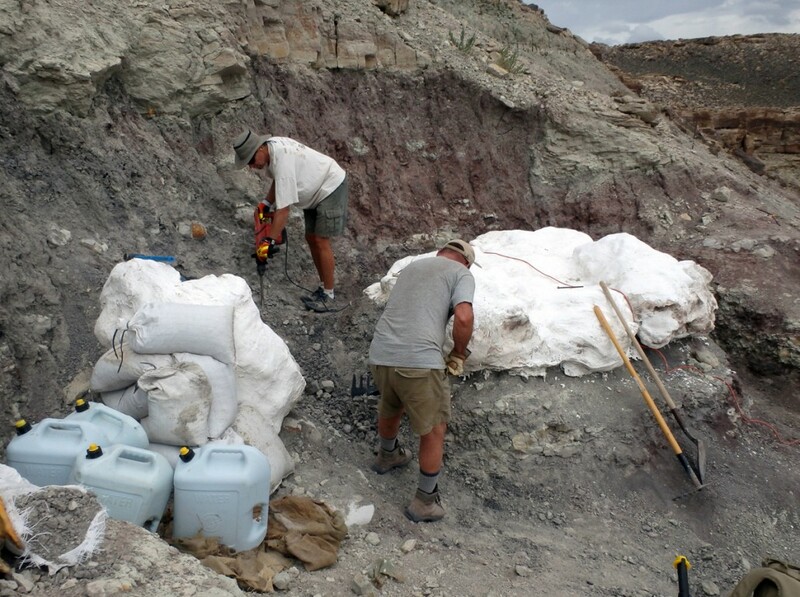 “If we knew how much work it was going to be we would have kicked some dirt over it and walked away!” says Utah Geological Survey (UGS) Paleontologist Scott Madsen. Although he was joking, this is how the UGS paleontology team felt many times over the nine years it took to collect the enormous block of rock containing the fossilized bones of numerous plant-eating iguanodont and carnivorous Utahraptor dinosaurs. The site is located on a scenic ridge overlooking Arches National Park with Castle Valley and the La Sal Mountains visible in the distance. The marvelous view comes at a price—a steep climb up a slope of mudstone covered in loose rock and carbonate nodules. “When we first visited the site there was not even a place to stand without sliding down the hill, and we had to hack out a platform just to begin to evaluate the site” says Utah State Paleontologist Jim Kirkland. 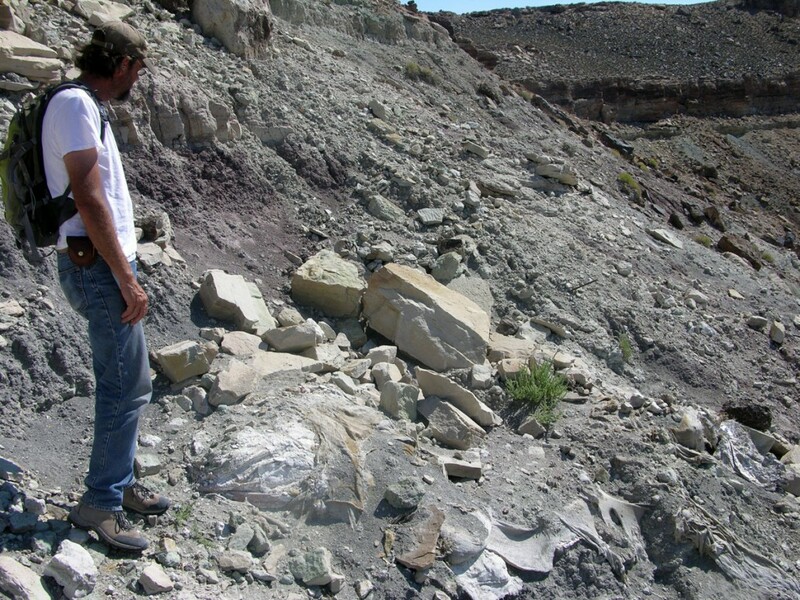 Discovered by Northern Arizona University graduate student Matthew Stikes during his thesis research, the so-called Stikes Quarry is in rocks of the Yellow Cat Member of the Early Cretaceous Cedar Mountain Formation. 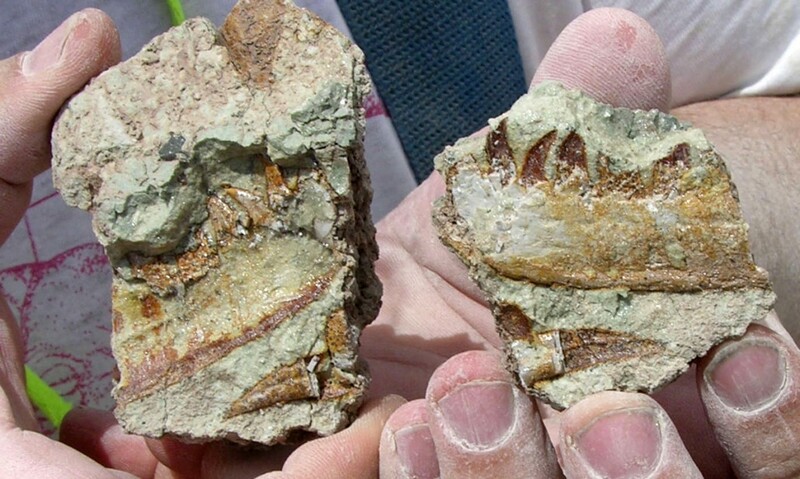 During our preliminary exploration of the site in 2005, one of the first rocks that Jim split open contained the front end of a Utahraptor lower jaw with all the teeth in place. The fact that the delicate teeth were still in place meant that the jaw had not traveled far, if at all, after the death of the animal. As we dug further we realized that there were many well-preserved fossils at this site, which turned out to be one of the most remarkable and important dinosaur sites that Jim, Scott, and I have ever worked on. The following year (2006), the UGS paleontology section was busy with several other excavations, so we enticed some colleagues from Washington University in St. Louis, Missouri, to take over, and with our help, they began excavating the site that summer. In a typical dinosaur excavation, rock is removed until a bone is found, and then rock surrounding the bone is removed until the bone is left sitting on a pedestal of rock. The pedestalled bone is covered in a protective jacket using either a plaster medical bandage if it is small, or casting plaster and burlap if it is large. After the jacket hardens, the pedestal is undermined, flipped over, and the bottom side is jacketed. Sometimes though, bones are so tightly packed that it is impossible to isolate individual bones for jacketing and larger blocks need to be excavated. We excavated a number of fossils including a roughly 1,000 pound jacketed block that was slid down the slope on an old car hood and brought to St. Louis for preparation. The bones from this block became the subject of a master’s thesis by Washington University student Karen Poole. Regrettably, the Washington University group was unable to continue their work at the site. In the summer of 2007, I visited the site with our intern Gary Hunt and we found that a number of large blocks of rock had fallen from the cliff above and knocked off a chunk of bone-bearing rock that had been jacketed the year before. 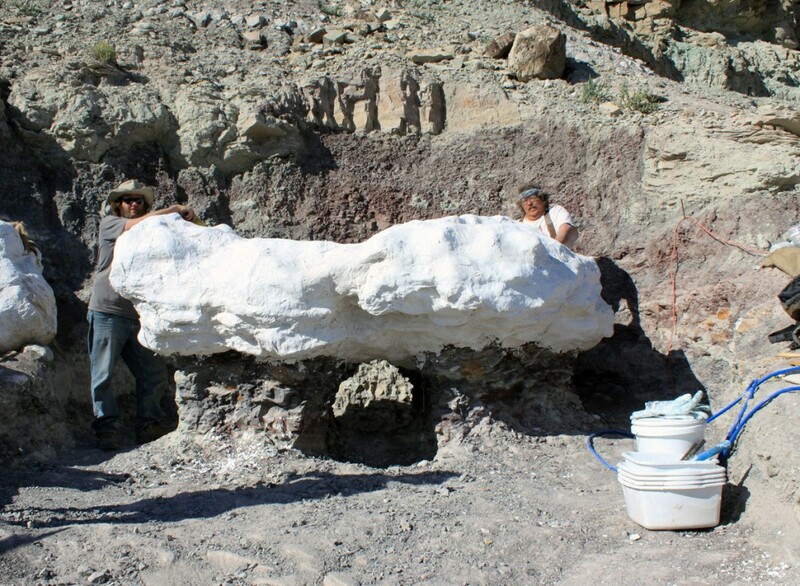 We salvaged what we could, including a section of a large adult Utahraptor jaw and part of the back of its skull, and then re-jacketed the damaged area. This was a wake-up-call for us and we realized that we would have to make it a priority to continue work at the site. For the next several years we tried to get to the site whenever possible to collect more of these important fossils. Each day at the site began with several trips up and down the down the steep slope carrying supplies such as plaster and water on our backs. One of our main concerns was to separate bones to make the size of the jackets manageable. Using small hand tools such as ice picks and dental tools, we began to separate individual bones. However, the bones were just too tightly packed to isolate them in the field. So we decided to try and collect an enormous block so as not to damage any bones. Fortunately, separating the block was straightforward because the bone-bearing mass was restricted to an isolated blob of green sandstone surrounded by red mudstone. Based on the geometry of the sediments and by comparing them with modern analogs, we hypothesized that this site represented a dewatering feature, essentially a quicksand, which trapped, killed, and preserved the animals found here. The shape of the blob made it easier to isolate without having to cut through bone. The block, however, would be one of the largest fossil blocks that anyone had ever tried to collect, and certainly one of the largest from such a difficult location. We initially tried to secure a heavy-lift helicopter to fly the block off of the hill. We worked hard to publicize the project with the hope that a company might donate the use of a helicopter since our budget would not allow us to pay for such an expensive piece of equipment. In 2011, we filmed an episode of the Discovery Channel program Dirty Jobs at Stikes Quarry. The show aired that fall, and though it was quite popular, no offers for helicopters were forthcoming. Recognizing that we would have to find an alternative, we enlisted the help of Don Brummel from Ames Construction to build a track up to the site that could be used to drag the block off the mesa with heavy equipment. This road would also facilitate the transport of materials and equipment necessary to build a frame around the block to support it during the removal. A rough preliminary track was completed in 2012, and in the fall of 2013 a volunteer provided an ATV to bring supplies to the site. We spent several weeks using an electric jackhammer powered by a gas generator and air hammers powered by an air compressor to move tons of rock from around the block. The power tools sped up the process, but the work was still very strenuous and we had to muck out our trenches by hand. We covered newly exposed surfaces with plaster and burlap to stabilize them, and we added many hundreds of pounds of plaster to the block, including the sides and bottom. We used a great deal of finesse to make the plaster a proper consistency so that it would stick to vertical and overhanging surfaces. By the end of the 2013 field season we were able to tunnel underneath the center of the block so that it was sitting on two large pillars. 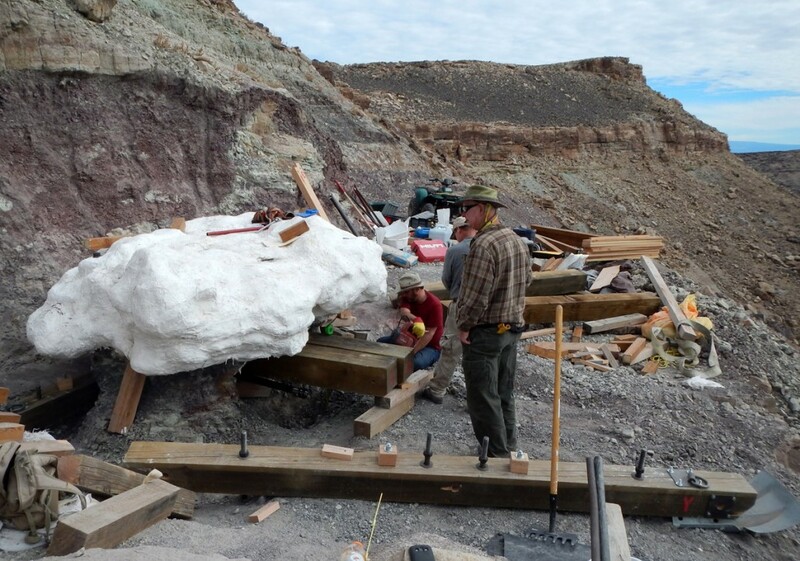 In 2014, veteran Utah Friends of Paleontology volunteer and mechanical engineer Phil Policelli helped design a wooden frame to place under the block that would also serve as a sled to be pulled down the slope. Jim Cross of Cross Marine Projects, Inc., a long-time supporter of the UGS Paleontology Program, provided space, supplemental material, and manpower to help Phil manufacture a frame that could be disassembled, transported to the site, and reassembled in place under the block. It took two weeks of full-time work to manufacture the frame, which consisted of 10 x 10-inch and 8 x 8-inch wooden beams up to 10 feet long that were bolted together and reinforced by large metal hardware. To get the frame parts to the site, Dan Harrison and his son Bo, of High Desert Excavating in Green River, Utah, offered the use of a bulldozer and a track hoe to complete the track to the site and drag the frame and block down the mesa. In November 2014, everything was in place to begin final assembly of the frame under the block. It took two weeks of steady effort to trim the block to accommodate the frame, assemble the frame under the block, remove the pillars from under the frame, plaster and shim the underside of the block, and strap it to the frame to ready it for the drag down the mesa. We were relieved that we accomplished this without any movement of the block and no injuries to any members of our team. It was an exciting day when the track hoe arrived to begin the drag down the mesa. National Geographic sent a videographer to the site to document the move. 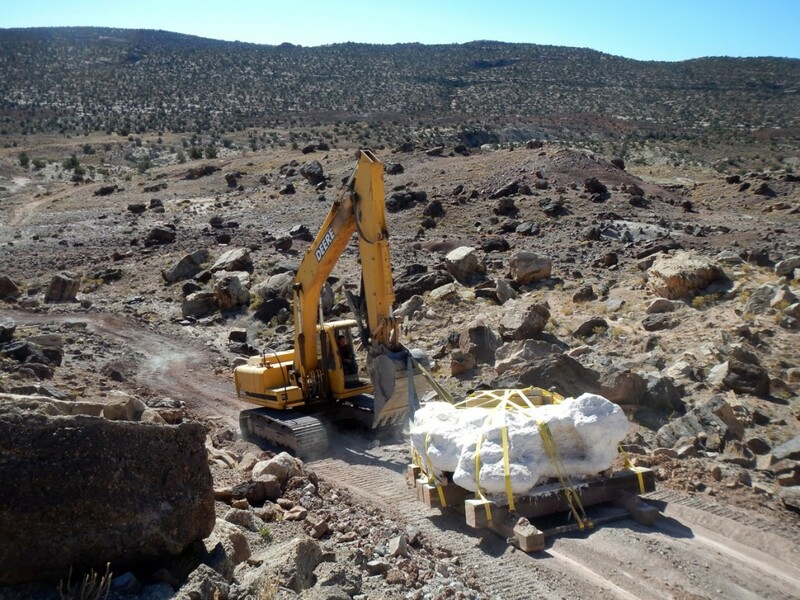 Our nerves were on edge as the track hoe began to pull and we heard the creaking of the frame as it ground over the rocky surface, but all stayed rigid and secure as the block moved from its resting place for the first time in 125 million years. Despite a few hiccups, we successfully dragged the block off of the mesa and loaded it onto a semi-truck for transport to Salt Lake City. The realization of our goal would not have been possible without the labors of many students and volunteers who spent hundreds of hours assisting us. With the block collected, our next hurdle was to find a large space to prepare the fossils since the block would not fit in the UGS preparation lab. Ultimately, the North American Museum of Ancient Life at Thanksgiving Point in Lehi agreed to provide a space in their preparation lab. 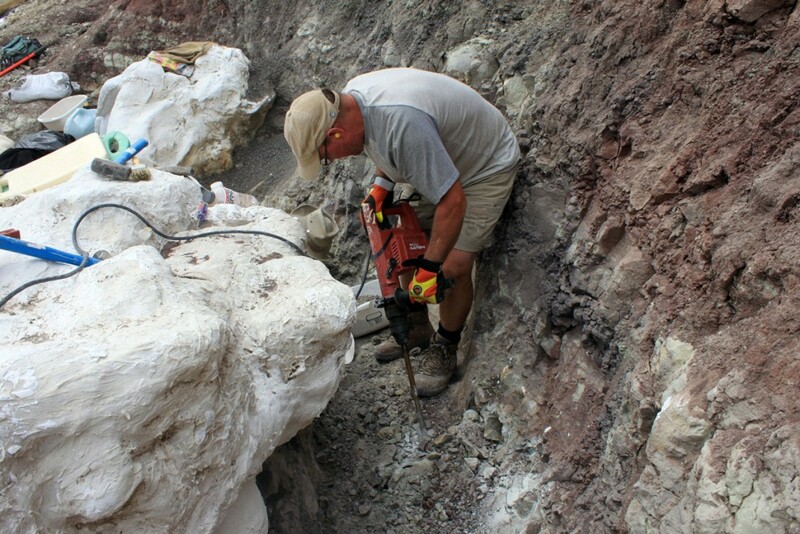 We are now working to obtain the necessary funding so that UGS paleontologist Scott Madsen, an expert in micro-preparation, can oversee the preparation of the block, a process that will likely take many years. We are excited to begin this next phase of the project and begin to reap the scientific and educational rewards of so many years of back-breaking labor.